For additional contact information including hours of operation, click here. 12/23/15: See news ticker above for holiday closures. Thank you for visiting our website. Links to our other pages can be accessed in the upper left corner of any page or hyperlinks throughout the text. To find what you are looking for quickly, try our site search to find what you are looking for quickly. Our primary focus is based on continuous improvement to meet or exceed our customers expectations. We have been servicing Tooele County, Stansbury Park, Salt Lake City, and surrounding area for over 20 years. Since 2007, we have made many improvements including; increased the diversity of the services we provide such as carport/ garage/ & steel building sales, remodeled our RV & Marine parts store, organized and increased our inventory, upgraded our hardware & software to provide faster service, and much more. Our improvements are far from over and hope to continue our growth offering more inventory in our RV Parts store, more Recreational Vehicles , BOATS, and Automobiles at a fair price, and more specialized or custom services. We provide mechanical & electrical service for all types of recreational vehicles, marine, cars, and trucks. We also offer welding service for all types of repairs from household items to fabrication. In addition to our welding service, we also provide welding supplies and gases. 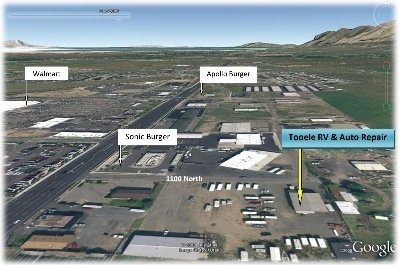 In addition, Tooele RV also has a propane fill station and LP maintenance services that include tank recertification, valve replacement, custom LP gas hose fabrication, LP gas accessories, and LP gas appliance service. Just click on the service tab above for more details. Furthermore, we have always and still provide low cost storage for motorhomes, trailers, cars, truck, or anything else on wheels. Over the last few years our primary focus is based on quality. As a result we have increased our customer base by 30% and our volume of insurance and warranty related work has increased by 75%. We are very proud of our work and feel privileged serving our local community in Tooele, Utah and visitors, doing what we do best and with honor. We invite you to see our work in our photo gallery page showing in depth before and after pictures. After viewing what we are capable of, we hope that you will trust us with your RV or vehicle if you ever have the unfortunate event of needing a large repair. Effective December 2013, we are proud to announce that we are now a NAPA AUTO CARE CENTER. This means that most repairs are backed by a Nationwide Warranty for 2 years / 24,000 miles. Our service warranty is provided at no cost to the customer. This is service will not only double the mileage but also the length of the warranty versus our previous Certifed Auto Repair service that was provided. STAY TUNED FOR MORE UPDATES! handle. EPA, CARB and CETL compliant. The PH2100PRi comes with an oil jug, 12V charge cable, spare spark plug, spark plugwrench & handle, oil drain extension, spare 10A glass tube fuse, user’s manual, keys andremote. Includes 2-year consumer warranty, 1-year commercial warranty. Click here to download specifications! Other models available with 24 hours. Many RV & boat owners are not aware that you can enjoy all of the benefits of all your home electronic needs without the use of a generator. For example, we can install a 3,000 watt DC to AC inverter that is capable of running your Roof A/C unit, microwave, TV, computer, satellite or any other A/C device. However, in order to achieve this capability, additional deep cycle batteries would likely be added. Furthermore, if enough solar panels were installed, a generator would not be needed to recharge the batteries. Imagine being completely self sufficient without consuming fuel or electricity supplied by the local power company and without creating any noise from a generator. We now offer interior LED lighting that provides 40% more light and reduces power consumption by 85%. To put this in perspective, 11 primary LED ceiling light fixtures consume the same power as 1 incandescent fixture. This is another way of extending the life of your batteries without adding more batteries, frequent battery charging, or having to plug in your shore power cord at some crowed RV park or marina. We are adding new LED products regularly as well as solar power options. Stop in to see what is new. See our custom electronics page for technical custom installations we provide. If you are seeking a career in the automotive or RV industry and are interested in pursuing employment with our team, please click on the contact link above for current positions or simply click on this shortcut for employment. In brief, you should know the following about us: our company was incorporated in 1991 and has been responsible for providing outstanding RV, Marine, & Auto sales & service, Welding supplies & gases, Propane, and Retail Accessories ever since. For directions to our facility, click on photo below.